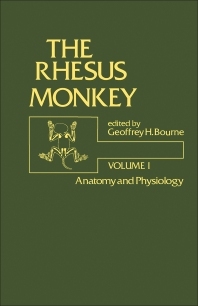 The Rhesus Monkey, Volume I: Anatomy and Physiology discusses the anatomic and physiological measurement, microscopic anatomy, learning, skills, general behavior, and vocalization of rhesus monkey. The rhesus monkey (Macaca mulatta) is widely used for biomedical and psychological studies. Accordingly, an enormous fund of scientific information is available in papers and some collected data. This book is generally a collection of data from over 2000 papers on rhesus monkey. It covers topics on the cerebral angiography, electrocardiogram, and vector cardiogram of the rhesus monkey. It also provides additional information on morphology and function of rhesus kidney; the development and eruption of teeth in rhesus; and the histology and histochemistry of the rhesus monkey. This book serves as an invaluable reference work for all who work with this primate.